When you’re shipping lots of goods, packaging them up can be incredibly time consuming. While some of us may be tempted to skimp and move the process along quicker, we should all do ourselves a favor and spend a few extra minutes properly preparing packages for shipment. Five or ten extra minutes of packaging will always pay off when your shipment arrives to its destination in perfect condition. Those five or ten minutes saved when you skimp on packaging will create nothing but headaches when your goods end up at their destination damaged. How you should package your shipment depends heavily on what you’re shipping. If you’re shipping a diesel engine, it won’t require the same attention as shipping an antique Tiffany glass lamp. Though Freight Rate Central only services shipments that are over 100 pounds, there are some general guidelines that can help you package your shipments regardless of their size or nature. • Choose a strong shipping container. 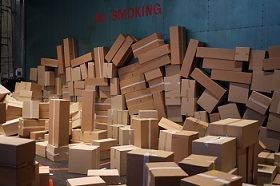 If your shipment requires a container of some sort, you’ll most likely choose between a cardboard box and a crate. If you choose a cardboard box, it’s best to use a new one. If you don’t have or can’t get a new one, make sure you use a sturdy, undamaged box. Your box acts as the base of your shipment, and if it’s flimsy and can’t withstand the weight of your goods, things will go south very quickly. The same holds true with a shipping crate. Make sure it can withstand your shipment and isn’t damaged in any way. A good rule of thumb to abide by is to always leave 2’’ of space between your goods and the inside of the container. When filled with cushioning materials, this will help protect against damage if force comes into contact with your box from the outside. • Securely seal the package. Doing all the hard work of cushioning your shipment only to have the box come undone during transit is an inconvenience you can avoid. Tape down both the top and bottom of your box with strips of strong tape at least 2’’ wide (be sure to get all the seams covered where your box could come apart). Pressure-sensitive plastic and nylon reinforced filament tape are your best bets. Avoid masking tape, cellophane tape, and duct tape, as these won’t hold up during shipping. Following proper packaging techniques will help to ensure your goods get delivered to their destination unscathed. If you have any questions about packaging your particular shipment, Freight Rate Central is happy to help. Give us a call or reach out to us online.